The Keene, N.H., Fire Department recently ordered a Pierce Ascendant 107-foot steel heavy-duty aerial ladder to add to its fleet from Pierce Manufacturing. 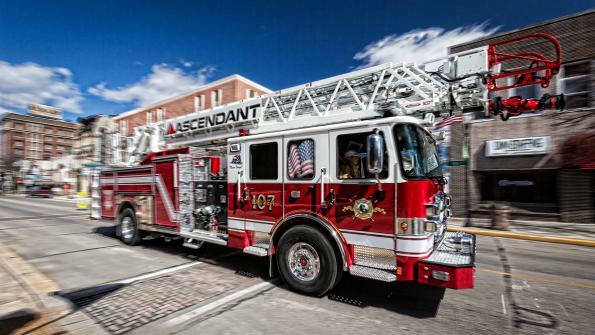 The Keene, N.H., Fire Department recently ordered a Pierce Ascendant 107-foot steel heavy-duty aerial ladder to add to its fleet from Pierce Manufacturing, an Oshkosh company. Delivery of the unit is scheduled for this coming October. A committee of three from the department was assigned to develop the specifications and make recommendations to the fire chief. “Our goal during this process was to stay with a quintuple combination pumper configuration, keep the same overall sized vehicle, not compromise performance, add improved safety features, and get a longer ladder, if possible, and that’s a tall order,” says Fire Chief Mark Howard, a 23-year veteran of the Keene Fire Department. The unit’s 107-foot aerial ladder features a weight optimized design structure that places weight and mass only where required. The aerial delivers a full 107-foot vertical reach and a 100-foot horizontal reach with a below grade operation of -10 degrees. The ladder’s reach is 32 feet greater than a typical single rear axle aerial. Since its launch, the manufacturer’s research and development team has successfully completed three phases of a fatigue test on the Ascendant that demonstrate the equivalent of 20 years of service life. A Pierce dealer, Minuteman Fire and Rescue Apparatus of Walpole, Mass., provides local service and support for the Keene Fire Department. The Pierce Ascendant is available on a range of Pierce custom chassis, including the Arrow XT, Velocity, Impel and Enforcer. Additional body configurations introduced since the launch of the Ascendant include the PUC pump, Texas Chute Out body (side stack hosebed), and a no-pump/no-tank design.